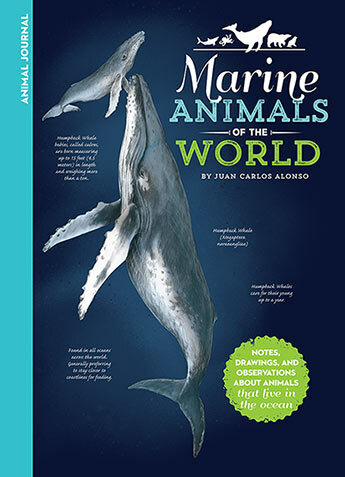 Marine Animals of the World explores marine animals with readers. See the adorable sea lion, the majestic killer whale, and others, and learn each animals size, habitat, diet, and more. Marine Animals of the World guides readers on an exploration of the worlds most fascinating marine animals, from the adorable sea lion to the majestic killer whale. Young naturalists will explore different habitats both near and far, from the icebergs in the arctic to the depths of the Pacific Ocean. This naturalists notebook gives budding biologists the opportunity to explore new and unfamiliar species, animals they may not get the chance to see in person. Marine Animals of the World features gorgeous and detailed illustrations that paint a realistic picture of many favorite marine animals, and highlights the subtle differences among the subspecies. This guide to the undersea world also provides interesting and educational facts about each featured marine animal, including its scientific name, average size, habitat, diet, and other interesting facts. From sea turtles to bottlenose dolphins and sharks, adventure awaits as explorers travel across the globe to catch a glimpse of the worlds most wondrous marine animals. Juan Carlos Alonso is a Cuban American graphic designer, creative director, and illustrator. He has over 30 years experience in the graphic design/illustration field. In 1992, he founded Alonso & Company, a creative boutique specializing in branding, design, and advertising. His passion for nature has taken him around the world from Australia to the Galapagos Islands to study animals. Along with his work in the graphic arts, he is also an accomplished wildlife sculptor focusing mostly on prehistoric animals.